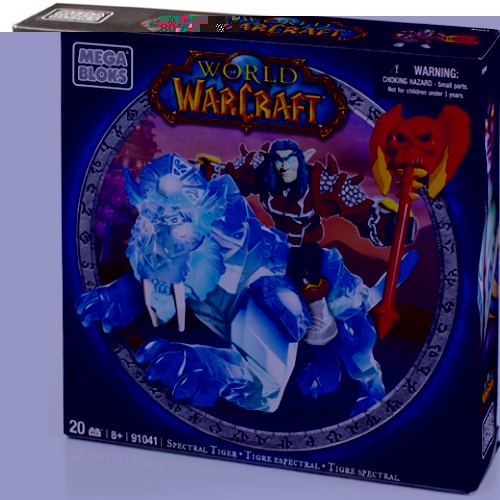 Product Detail Summary: From Mega Bloks World of Warcraft, build and customize the Alliance Spectral Tiger, the phantom saber mount of Stranglethorn Vale. Includes Seperon, the bold Night Elf death knight who fearlessly rides his Spectral Tiger into battle! Seperon features interchangeable gear, including a set of war plate and the powerful Nightfall two-handed axe. Buildable Alliance Spectral Tiger mount, with seat for micro action figure. Buildable Night Elf death knight micro action figure with customizable armor. Collectable death knight armor and weapon to mix and match.